‘Tis the season: Pumpkin spice lattes, pumpkin pie, jack-o-lanterns… Fall is in the air and it’s time to embrace the ever present orange gourd. But why not have a pumpkin facial along with your latte? There is more than meets the eye when it comes to this orange-skinned fruit. You just might want to hold the cinnamon and nutmeg. Vitamins C and A. Minimize the damage caused by free radicals and increases collagen production in your skin, giving it that plumped, fresh look. Carotenoids. Carotenoids beta carotene are antioxidants that also give the pumpkin it’s orange colour. They’re known for helping with reverse skin damage caused by UV exposure. B vitamins and other minerals like potassium, magnesium and manganese. Pumpkin can help smooth out skin and help minimize the signs of ageing like no product on the drug store shelf can! You’ll get maximum benefit from fresh pumpkin puree but, in a pinch, the canned will do. Cut your pumpkin in half and take out all the seeds and string, leaving the pulp. Put cut down on a baking sheet and put in a 375 degree oven for about 2 hours (depending on the size of your squash!) – it’s ready when you can poke it with a fork. Let it cool and then scoop out the pulp and put it in your blender or food processor to puree. There is still a lot of water in the puree so you should let it drain by lining a strainer with cheesecloth or paper towels and letting it sit for a while. The real benefit of pumpkin is the natural alpha hydroxy acids, which are the cornerstone to all exfoliants. Whether your skin is oily or dry, you should gently exfoliate regularly to ensure a smooth, blemish free appearance. For oily skin, mix a quarter cup of your puree with a tablespoon of apple cider vinegar and a whole egg. Apply the mixture to your skin for 20 minutes and then rinse completely. (source). For dry skin, replace the apple cider vinegar with a teaspoon of olive oil and a teaspoon of honey. When you want to be a little more active with your exfoliation, you can use a few tablespoons of the pumpkin puree with two tablespoons of plain yogurt. The yogurt contains lactic acids, which are also a known exfoliator. Add a tablespoon of oats, mix and put it on your skin. Let it sit for a few minutes and then scrub in a circular motion, rinse and reveal! At this time of your, no matter how much you hydrate, you can find your lips getting a little, shall we say… scaly? Mix four tablespoons of puree with two tablespoons of brown sugar and one of olive oil or coconut oil. Rub it onto your lips, again in gentle, circular motions and the sugar will loosen and remove any dead skin, the olive oil will moisturize and the pumpkin? All those good vitamins will help plump up your smackers! The beauty of this scrub is it won’t matter if you lick your lips after: it’s all good for you, inside and out. To add some shine to your locks, just mix a cup of puree with half a cup of plain yogurt, a tablespoon of coconut oil and two tablespoons of honey. Apply it to your hair, paying special attention to your scalp and the ends and let it sit for about half an hour, rinse it out and then wash your hair, as usual. Add pumpkin seeds to your trail mix snack! They are full of zinc, which has anti-inflammatory and antibacterial properties, helping reduce redness and blemishes on your skin! Zinc also helps to control oil production on your skin, including your scalp. Plus the seeds are just plain tasty! 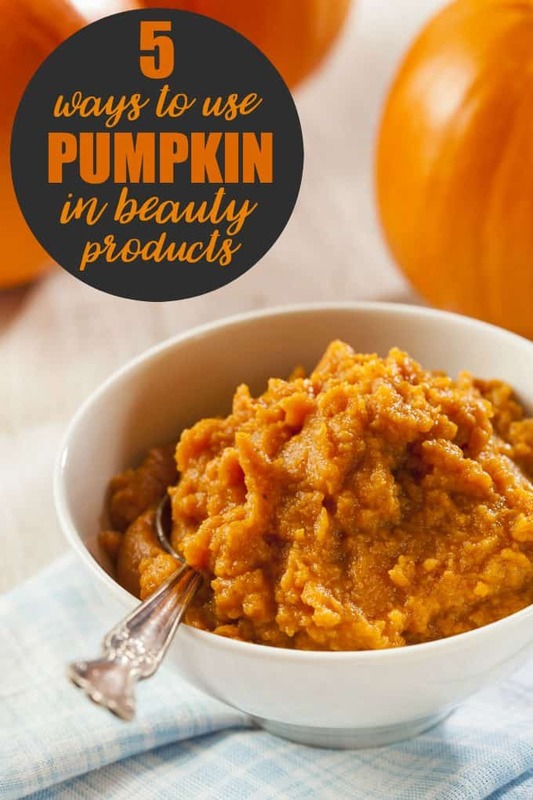 Do you use pumpkin as your secret ingredient in your beauty routine? I had no idea you could use pumpkin for so many different things. I will definitely be trying these. I’ve never tried pumpkin for any of these. Does it make me look orange? I want to try a Pumpkin Facial and scrub. It sounds amazing and fun to try. I bet the pumpkin facial makes my skin feel soft! One of the best things about fall is pumpkin everything!